A Fenland narrowboat break is ideal for the boater who wants to explore “off the beaten track”, getting away from the more obvious canal holiday destinations. This ultimate guide to these undiscovered waterways suggests 10 things you can do to make your hire boat holiday amazing. Begin in March at our hire boat base, and then maybe visit the Ramsey Rural Museum. When you explore the Middle Levels you’ll discover the twin villages of Upwell and Outwell. Upwell is one of the prettiest villages on the Fenland waterways. (Try mooring at The Five Bells Inn for a real ale.) Outwell Basin also provides some idyllic moorings and The Crown Lodge Hotel moorings are the last opportunity to moor for a drink before the tidal crossing at Salters Lode. From friendly lock keepers, to wind farms and kingfishers; Seven Surprising Differences We Discovered Cruising the Middle Levels. The River Great Ouse is a beautiful river which will allow you to visit St Ives, Ely and Cambridge. You’ll be able to see historic buildings, parks and ancient monuments if you take this route. OuseFest is a local Cambridgeshire event that falls right in the middle of the summer narrowboat holiday season. 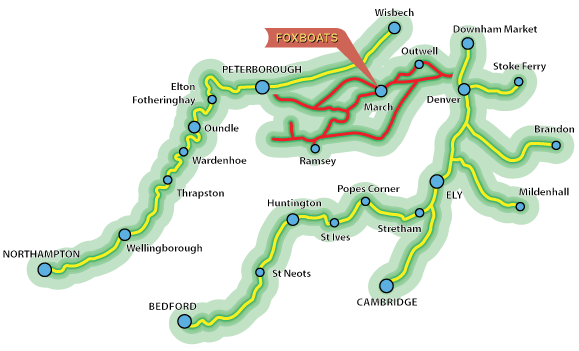 Don’t Miss #Ousefest on your Summer Narrowboat Holiday! A visit to a museum can not only be surprisingly fun, but it is often a free day out! You will be spoilt for choice with Peterborough Museum, March and District Museum, Ely Museum, The Stained Glass Museum, Prickwillow Museum and The University of Cambridge Museums and Collections. Read more: Are Museums Ever Fun? The Answer Might Surprise You. You may also like Fenland Food and Dining: The Ultimate Boater’s Guide. No experience required! You will be fully trained as a narrowboat steerer as part of the boat handover routine. One of our RYA qualified instructors will explain how to operate the locks and will not let you start your narrow boat holiday until you are comfortable. The training will take place at the start of your holiday if you need it. Ready to do amazing things? Check here for availability of boats and dates to suit you.